How do we connect with church, why are people leaving church…. What is Church? 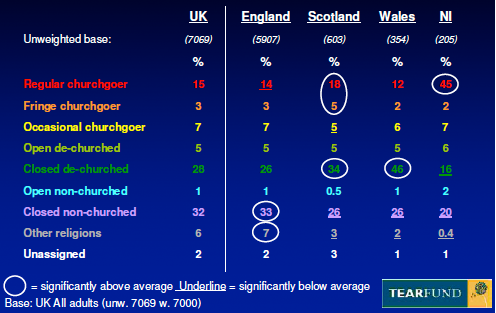 Reading Rachel Evans blog post this morning I was reminded that in 2007 Tearfund published a report into church attendance in the UK (available here). I had found this report interesting reading and I found it concerning that 34% of those interviewed in Scotland had been in church, had left and had no intention of returning (Closed de-churched)… and adding this to those who never had a church and would never consider it (Closed non-churched)… then 60% of those who took part in this survey perceived church was not relevant to them and they didn’t want to know. God called us (and gives us the way of restoring us) both into a relationship with Him, and into relationship with each other… working out our heavenly salvation, here on earth with the people he brings to us… this (for me) is the substance of Church: Relationship. The following is a repost of a blog article from the CNN Belief Blog by Rachel Held Evans on why young adults are leaving church (click here for original article) – this article is offered not as a solution, but to stimulate thought… to aid prayer… for us to come to God and ask Him what He wants His church to become. This entry was posted in Effective Church and tagged church, connect, Jesus, Prayer. Bookmark the permalink.